Is it a failure to communicate, or faulty climate science? | Watts Up With That? Is it a failure to communicate, or faulty climate science? Originally published in The Washington Times. Earlier this month, a New York Times article by Andy Revkin voiced concern over a gap between “the consensus” of climate scientists and public acceptance of the theory of human-caused global warming. Revkin pointed to a study published in April by Dr. John Cook and other researchers, which claimed that 97 percent of scientific papers over the last decade “endorsed the consensus” of man-made warming. But is it a failure to communicate the science to the public, or a case of bad science? A 2010 paper from the Center for Climate Change Communication at George Mason University recommended that advocates for activist climate policies emphasize the dangers to the health of citizens: “Successfully reframing the climate debate in the United States from one based on environmental values to one based on health values…holds great promise to help American society better understand and appreciate the risks of climate change…” So, if Americans fear for their health, then they’ll more readily accept that humans are causing dangerous climate change? Climate science has smelled for some time. The 2001 Third Assessment Report of the Intergovernmental Panel on Climate Change (IPCC) announced “new evidence” claiming that “the increase in temperature in the 20th century was likely to have been the largest of any century during the past 1,000 years.” This was the famous “Hockey Stick Curve” of Dr. Michael Mann, which became an icon for Climatism, trumpeted to the world and taught in schools across the globe. But the tree-ring data used by Mann and his research team did not show a temperature rise at the end of the 20th century, so they pasted the thermometer record for the last 50 years onto the 1,000-year curve to provide the alarming hockey stick temperature rise. Later analysis by Stephen McIntyre and Dr. Ross McKitrick found that the Mann algorithm would also produce a hockey stick from input of random noise. The IPCC dropped the Mann Curve from their 2007 Fourth Assessment Report without any explanation. Then in November 2009 came Climategate, the release of e-mails from the Climate Research Unit (CRU) at East Anglia University. An unidentified hacker or whistle-blower downloaded more than 1,000 documents and e-mails and posted them on a server in Russia. The CRU is the recognized leading keeper of global temperature data, and CRU scientists wrote and edited the core of the IPCC reports. The Climategate emails showed CRU practices that were seriously at odds with accepted scientific procedure. Evidence of bias, data manipulation, deliberate deletion of emails to avoid sharing of information, evasion of freedom of information requests, and attempts to subvert the peer-review literature process were all used to further the cause of human-made global warming. Based on model projections, the IPCC First Assessment Report of 1990 told the world to expect a “best estimate” rise of 0.3oC per decade in global temperatures, leading to 2025 temperatures that would be 1oC higher than 1990 temperatures. 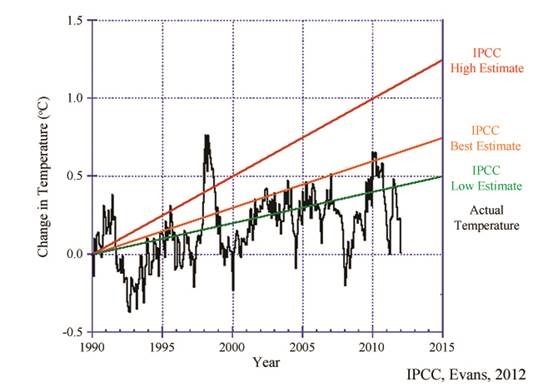 The IPCC also projected a “high estimate” and a “low estimate” rise. Today, global temperatures remain well below the IPCC’s low estimate. Contrary to model projections, temperatures have been flat for the last 15 years. It doesn’t matter if 97 percent or even 100 percent of published papers endorse the consensus of man-made warming. One hundred percent of the world’s top climate models, 44 models in all, projected a rise in global surface temperatures over the last 15 years. And 100 percent of the climate models were wrong. The empirical data does not support the theory of dangerous man-made climate change. Since global temperatures are not rising, proponents of man-made climate change are now reduced to weather scaremongering. In the best tradition of ambulance chasing, the recent severe tornado in Oklahoma, Hurricane Sandy, and other weather events are blamed on mankind’s relatively small contribution to atmospheric carbon dioxide, a trace gas. But any citizen who can read can learn that today’s weather is not abnormal. Hurricane Sandy was a Category 1 hurricane that made a direct hit on New York City. But according to the National Climatic Data Center, 170 hurricanes made US landfall during the 20th century. Fifty-nine of these were Category 3 or better, with wind speeds much stronger than those of Sandy. So how is a single Category 1 hurricane “evidence” of dangerous climate change? Historical data also shows that the US experienced more strong tornados in the 1960s and 1970s than today. The reason for lukewarm public acceptance of the theory of man-made warming is not a failure to communicate, but that the science is rotten. Steve Goreham is Executive Director of the Climate Science Coalition of America and author of the new book The Mad, Mad, Mad World of Climatism: Mankind and Climate Change Mania. Pushing that global warming will harm our health is a joke. We have Obama care to take care of us! Simply put and well thought out… Very nice! Linking to it from other places! this is one that will allow even the most unscientific person a glimpse into the world of the alarmists mirrors..
Making a value claim in defense of global warming is completely irrelevant, considering most people’s arguments are based on the knowledge claim that we can’t know what causes the Earth to warm or by how much the Earth will warm. Here’s the graph pitting the 44 climate models against reality. His CV, available here, says that he is “John Cook, B.Sc.H.” and he got that Bachelor’s degree in 1989. What we have here is a failure to pontificate. AGW alarmist have to keep probability in mind when telling a lie. The 97 per cent consensus is just like the free and democratic elections in the “democratic republics” of this world where the present leadership gets 99.999 per cent of the votes against the token opposition. Cook should have just cook the statistics to around 55 to 70 per cent to be more realistic and acceptable. Second, most voters are now fully aware that the inherent nature of natural science such as climate science is against consensus. The monitoring data and experimental results counts. A 97 per cent consensus or even 99.9999 per cent consensus does not mean anything. Third, the search for consensus has only exposed that AGW is not about science but about politics and should be treated like a political issue . Fourth, and the most important factor is the economic conditions in the Annex I countries of the UNFCCC. The extra $300 per person per year additional cost of power and energy would mean little if work and future income is assured and increasing. With historic level of bankruptcies and unemployment in the Annex I countries and in some instances leading to suicide, riots and social unreast , the $300 would mean a lot. The voters have more present and pressing problems than 1 C raise in temperature or 400 ppm of carbon dioxide. Lastly, politicians to survive and promote their careers have to assess the voters’ attitude. Hence, it is not surprising for politicians to change their views on AGW as they assess the voters’ attitude. How could politicians justify the additional cost of energy and power, losing international competitiveness, shrinking manufacturing and industrial sectors and with large number of voters without work or uncertain with their future financial security ? What is important in the current debate is to plug the way for potential re-emergence of AGW or even global cooling in the political arena. Unlike the Y2K scare, AGW or global cooling have longer time scale or even open ended that it will not pass away easily.We are too early for a Y21 scare– the year 2100 is divisible by 4 but will not be a leap year so computers will automatically add a day that could cause the end of the world just like those predicted by the Y2K bug. Eliza, hope you are right, but expect you are wrong. Too much financial inertia. Fight against! Just curious: I know there is a Dr. John S. Cook at U Queensland, but his biography doesn’t quite match up with that of the SkS blogger. Is the John Cook of Cook et al. (2013) the same person as John Cook of SkS? And is he truly a “Dr.”? Michael Mann didn’t get his original two hockey sticks (MBH98 and MBH99) by grafting the temperature record on to the end of his tree ring series. Steve McIntyre has corrected this misperception a number of times. Mann got his original hockey sticks by promoting the White Mountain strip bark bristlecone-pine tree-ring record up into PC1 using his false short-centering scheme. His unwritten and faked assertion is that a few strip-bark pine trees in the White Mts. of California are an accurate proxy thermometer for 600 years (MBH98) and 1000 years (MBH99) of global average surface air temperatures. Quite apart from the garbage method, the promotion of tree rings into Celsius absent a physical theory is pseudo-science to the max. It’s like Astrology decorated with linear algebra. The worst of it is that this abuse has been accepted without protest by the Physics establishment. It’s his offense but their shame. Given Steve McIntyre’s revelations, the contents of Michael Mann’s ‘back to 1400 CENSORED’ directory make it abundantly clear that he knew his method was false. But he published anyway, and has gone on to receive honors; the opposite of what he merits. Cook’s degree, which he does state properly further down in his CV is a plain B.Sc. The with honors thing is not part of the degree (usually stated as B.SC. with honors in X). The University of Queensland does not offer a B.Sc.H. degree. Cook made it up to aggrandize himself. John Cook of SkS is the same as Cook et al. (2013). And no, he’s not a doctor as my post above indicated. He’s has a three-year undergrad in basic science with a Physics major. And judging from this, looks like he’s going for his masters in psychology, due 2014. Center for Climate Change Communism..
Good article. Glad to see you agree there is a consensus. What is it, when Alarmists try to scare people into doing what they desire? Science, or the behavior of a playground bully? If it was science, then a reasonable and scientific response would suffice. However a reasonable and scientific response has been given, and the return is just more bluster. One gets the impression one is dealing with a bully, in which case the appropriate response is never to back down, but rather to go toe to toe, eye to eye, and scare them right back. I expect in the future, historians will concede that the team communicated their shoddy science very well. A large fraction of the public also used to doubt the cancer-cigarette link and currently doubts the theory of evolution. Is that because the science is weak or is it because there is an organized and well-funded and/or motivated opposition to the implications of the science? (In keeping with a theme of mine) The very fact that there’s a “Center for Climate Change Communication” tells us that 1) there are people who think that such a place is a valid way to spend funding dollars; 2) that those people are a hubris-packed lot of scare-mongers if they think that climate change should be presented as an alarming situation; 3) that those people have zero grasp of the real world, choosing instead to sit on committees that actually discuss the content of 1 and 2…and present ‘results’ that they somehow believe to be important stuff for public consumption. Do they really think that anybody gives a rat’s arse about their contrived babblings???? Holy hannah what has this “science” been reduced to? Nobody cares, so let’s scare the bejesus out of them instead? What utter lunacy. I’ve been putting Australian climate scientists down on this forum for some time, however in the past Australian scientist have been BRILLIANT and here is one that that explains in 15 minutes clearly the whole issue absolutely! I should point out that Prof Plimer is a geologist but because of that he is a real “climate Scientist” Climate change equal 1000’s if not 100’000 years change..
looking at energy-in, 44 years of warming followed by 44 years of cooling. Danger from global cooling is documented and provable. It looks we have only ca. 7 “fat” years left (2013 – 88 = 1925), probably even less. Where have we heard this “bad science” claim to justify ignoring the majority of the scientists in favor of a minority of ideologically-driven dissenters? Maybe places like here: http://midimagic.sgc-hosting.com/evolute.htm ? On timescales of a few decades, the current observed rate of warming can be used to constrain the projected response to a given emissions scenario despite uncertainty in climate sensitivity. This approach suggests that anthropogenic warming is likely to lie in the range of 0.1 to 0.2°C per decade over the next few decades under the IS92a scenario, similar to the corresponding range of projections of the simple model used in Figure 5d. There are also problems with the graph by Christy linked to in this post, including questionable (and unexplained) methods of aligning the empirical data with the model predictions and using the satellite LT data in preference to the surface temperature data that the models are actually predicting. Trying to invoke climate change as a health issue really gets my blood on boil. Every single stinking thing about that insidious effort (I did say it gets my blood on boil, didn’t I?) will prove to have the exact opposite effect on people’s health. First, let’s start with electricity and consider how every CO2 mitigation policy has led to electric rates that “necessarily skyrocket.” No one disputes this. So how the hell does the elimination of low cost electricity positively impact health outcomes? How? Explain it? How many people with lung disease or heart problems are on medical oxygen? Those home oxygen concentrators are electrical hogs as are the pumps attached to them that, over 1-2 hours, can fill oxygen travel tanks all the way up to 2,000 psi. Yeah, raise the electrical rates for that. And then ask the elderly, those with asthma, cardiac issues, and lung problems to give up there Air Conditioning unless they can maybe grow magic fairy money trees in their living rooms to pay those skyrocketing, fraudulent, earth saving electrical bills. Then let’s tell the elderly and those on disability to give up their cars and either languish at home or wait out in the wind on a bus corner when it’s five below outside. That’ll be good for the old heart. No problems with bronchospasm with that one. Isn’t it fascinating how their pre-industrial fairy tail natural Garden of Eden had such bang up great health outcomes, eh? No famines, no plagues, just real long predictable life spans, eh? I think not. Yeah, they wanna’ bring up bald faced lies about negative health impacts from make-believe global warming, well I say, bring it up. OK, Ryan: Are we plebians dumb because we doubt that there is a theory of evolution, or are we dumb because we do not buy, on faith, that “the” theory is accurate? Upon what obvious data should we accept “the” theory of evolution? Has it been “scientifically” demonstrated, or observed? Where have we witnessed a chromosome being added? Nowhere. “Evolution” is quite handy for us scientists to claim that everyone should throw off the shackles of repressive religious dogma. And switch allegiance to us educated elites, who should now take over Rome in ruling the world. Many scientists are finally realizing that the ever-changing “theory” of evolution is quite a slippery tautology. The giraffe has a long neck because – get this – it was advantageous to have a long neck. Circular? Like an orbit. Disprovable? Nope. The problem here is the assumption that it will be climate business as usual. 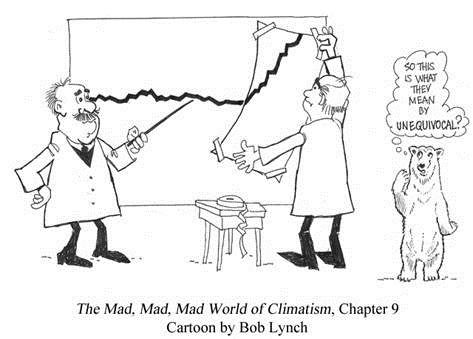 What if climate business as usual actually IS usual? At the half-precessional old Holocene, and a few centuries change, there is a 7 in 8 chance that with the sun gone all quiet on us, and insolation remarkably close to that at the end-Eemian, we could slope-off into the next glacial. Climate business as usual informs us that there is actually a 1 in 2 chance. MIS-1, the Holocene, is the 3rd post-Mid Pleistocene Transition (MPT) interglacial to occur at an eccentricity minima, like MIS-11 and MIS-19 did. MIS-11 went long (that 8th interglacial, smack dab in the middle of post-MPT time). MIS-19 didn’t (it occurred pretty much at the MPT). It really does not get any more complex, or for that matter simpler, than that right there. CAGW grant whores have painted themselves into a very tight corner, but they’ll be happy to tiptoe out on the backs of Hansen, Mann, Jones, Pachauri et al if it will help save their jobs and tenure. The MSM will feign to be, “Shocked, SHOCKED! to find gambling being done in this establishment”, and will probably blame the whole mess on scientists that perhaps meant well, but simply made some “honest mistakes” along the way…. Regardless, the world must stop wasting $trillions on this CAGW scam. It doesn’t really matter whether CAGW ends kicking and screaming or with a whimper, it only matters that ends as soon as possible before more economic devastation can be inflicted. Whatt’s with Revkin? Sometimes he seems almost rational. Then he turns around and does something like point to Cook’s “study” as evidence. Doesn’t he bother to do basic fact checking before writing his articles? He’s been misled so many times by climate activists and had to backtrack that at some point you’d think his BS Meter would be a little more attuned to alarmist nonsense when he hears it. One thing that the people you describe as “those people have zero grasp of the real world, choosing instead to sit on committees that actually discuss the content of 1 and 2…and present ‘results’ that they somehow believe to be important stuff for public consumption,” fail to understand is that they as sitting on the shoulders of others, and Atlas can shrug. They seem primarily concerned with preserving their position. They cling to the status quo and fear all change and progress. This isn’t so bad if they are just a grumpy old man who doesn’t like new-fangled things like computers because he has lived his whole life without them, and “you can’t teach an old dog new tricks,” however resisting change is downright repulsive when it fights progress that could better humanity, and instead actively and intentionally keeps the downtrodden todden down. What happens when they “win” is that their society atrophies and becomes backwards, and eventually they and their stagnant ilk are swept away by the rushing winds of progress. The hope is these selfish and destructive people become so atrophied they become unable to help themselves. History seems to show they always get swept away. Sometimes the wind comes from outside their society, and a Genghis Khan or Attila the Hun charges in and they find themselves too weak to resist, and sometimes a violent internal revolution results in them led to the guillotines, but sometimes the change comes more peacefully. Unfortunately even in the case of Martin Luther King and Gandhi some violence seems to occur, but it is far less than one might expect. Because I have rubbed elbows with some wealthy people in my time, I have seen what love of money (and clinging to a status quo) can do to people. They have no idea how absurd and pathetic they look to others, nor comprehend the life they are missing out on. What a miserable lot they are. Funny you should say that since that reminds me how Ancel Keys, by pushing the fat scare, managed to hide the immediate problem of cigarette smoking, heart decease. That became the accepted science for almost 40 years and while people ate more carbs and less butter to stay healthy, heart decease remained high even while the general population dramatically reduced cigarette smoking. Was that bad science, yes it was. Consensus on health effects reducing fat and increasing carbs was perhaps even stronger than on man made global warming. And to make connection with theory of evolution, I would like to quote John Shelby Spong: “Religion is always in the ‘control business, and that is something people don’t really understand; it’s in a guilt-producing control business.”. Yes, Americans doubt the theory of evolution to a scary degree because religion is involved but I would like it if you could support your other claim somehow. […] Doesn’t [Revkin] bother to do basic fact checking before writing his articles? He’s been misled so many times by climate activists and had to backtrack that at some point you’d think his BS Meter would be a little more attuned to alarmist nonsense when he hears it. I suspect that Revkin is profoundly challenged by what’s known as “confirmation bias”. Unfortunately, 97% of journalists (and others) whose output is indicative of this particular challenge have also been shown to have non-functional (if not unequivocally atrophied) BS meters. What is expressed in my equation is that CO2 concentration in the atmosphere follows the warm periods, it does not cause warming, e.g. The ice age trap which will be due to a) an accumulation of snow and ice NH and b) more clouds in the ocean rich SH, so that overall, there is whole lot less energy coming in. I count on man’s ingenuity not to fall in that ice age trap . I am thinking of using some chemicals or methods to melt the ice and to cover the snow so that not too much light is being deflected off from earth. I think we will be able to do something. Flat out shouting that they are Fear Mongers and nothing more. At the risk of feeding Trolls…. Yes, Evolution is “only a theory”; but a darned good one that covers most of the changes of life post bacteria. (It still has some issues with the origin of life, but it’s being worked out). 1) It isn’t necessary to fit “origin” into the time cycle of the Earth. Things form in space, too. So the first bacteria to form might well have done so many Billions of years ago, on some space lumps. 2) While the evolutionists have painted themselves into a “stupid corner” by defining hybrids between species as “not a species”; in fact, interspecies hybrids are likely the way we get added chromosomes and chromosome count changes. There is a very large literature on this (mostly in plants where polyploidy is nearly the norm…) and on the probability that viruses moved (and are still moving) large chunks of genetic material around between species. Most likely, Humans are an interspecies hybrid in origin. So, in fact, we’ve seen lots of “new chromosomes” created. Often from chunks of old ones. Sometimes via whole gene set duplications (polyploidy) and then differential mutation on the different sets. There are also a zoo of “mobile bits” of genes. All kinds of names. Transposons and inversions and more. Nature constantly reshuffles the deck of chromosomes and makes more / takes some away. Then tests the result. Blue eyes in humans is a relatively new innovation. Traceable back to one mutation event. The simple fact is that the Bible doesn’t preclude evolution; nor does evolution preclude a Supreme Being Creator (or even bored space aliens…); we simply read the story in too limited a fashion at times. So what’s the point of all the mud tossing? Just two sides with inflated self image and too narrow a world view arguing for their relatively over restrictive POV. Most of the “proofs” or “issues” each side flings at the other are simply wrong. Evolution has lots of holes in it, but the core is demonstrable. Creation is not contrary to evolution. We see evolution in action, it clearly is real and happens. Yet getting life started the first time is a bit hard to work out. (Possible, though, especially with the extra billions of years afforded by life in space, and more so with the idea of a large puddle of life that only later works out cell walls and individual living cells…) So might the first cell have been “created” then the rest is “left as an exercise for the planet”? Certainly. Then we get a 4000 year old “story” trying to describe that and picture an old man with a beard making each duck by hand… Just silly. So we don’t know how life started. That means that until we do, any theory is possible. Both the theory of a divine creator (though that raises the ‘who made the watchmaker’ problem) and the theory of long random chemistry (though might not the creator have made those rules of chemistry and set it loose?…) Since we can’t know at present: Staking out hard positions and tossing rocks from them is just a waste of time. Previous comment by em smith completely off topic. I am game to discuss evolution here mmm? Politicians always say that you misunderstand their point of view, when in reality you disagree with them. policycritic says: May 29, 2013 at 6:50 pm, John Cook of SkS is the same as Cook et al. (2013). And no, he’s not a doctor. Andy Revkin is as misled as a Concorde flies on rubber bands. He is a dedicated warmist who promotes their muck at every step. When situation becomes to blatantly hot for the culprit concerned, he then beats a strategic retreat as if he’s a neutral reporter and goes on with the advocacy of another climate change culprit the very next day. That works out to be a 3% drop in insolation from 428 to 416, since I had understood that the output of the sun, TSI, doesn’t vary by more than 1% it isn’t immediately obvious how we get a 3% drop in insolation, although easily accomplished by a similar percentage increase in cloud cover. But it is possible that conventional wisdom in climate science takes too simple and too linear a view of the processes in nature and that areas they have ignored will prove to have a disproportionate effect in the same manner that a catalyst does. Currently one ignored (by conventional climate science) part of TSI is extreme UV which is at record low levels and varies by factors of ten or more (http://science.nasa.gov/science-news/science-at-nasa/2013/08jan_sunclimate/) and has the effect of reducing the height of the atmosphere which is thought to influence the jet stream and other factors, and perhaps with it may also lower cloud height which will reduce temperatures. In addition, the magnetic fields of the Earth and the Sun are in steady decline and this is expected to lead to an increase in cosmic rays getting through to Earth’s atmosphere and increasing cloud cover, perhaps over that 3% figure. Combine these factors and we are looking at a cold future, one which has already started and will run until at least 2030, possibly longer. I have a question; we know the rate at which the magnetic field of the sun is falling off (Livingston & Penn & Svalgaard ?) so I was wondering if anyone knew what sort of increase in cosmic rays we can expect and from that what sort of increase in cloud cover (Svensmark, Kirkby) we can expect ? If so then it might be possible to come up with a date for when we get that 3% increase in cloud cover and the attendant drop in insolation that pushes us over the tipping point, not just into a new minimum, but possibly into a potential glaciation. ” . . . . here is one that that explains in 15 minutes clearly the whole issue absolutely! Thanks Eliza. Just watched it all. Excellent. Highly recommended. Prof Plimer and Lord Monkton should form a double act. However, if they were to do so, warmists would categorise their witty anecdotes as ‘satire’ (aka Clarke & Dawe or Jeremy Hardy style) – while we all smile knowing that despite their entertaining observations, their presentations are based on hard evidence, the facts and indisputable truth that CO2 is not going to cause Armageddon. Tom J’s comment (May 29, 2013 at 9:05 pm) says “Trying to invoke climate change as a health issue really gets my blood on boil.” Tom, I wish my blood would start to boil. I’m sat here in the conservatory with the iPad and it’s bloody cold for the end of May. (It still has some issues with the origin of life, but it’s being worked out). well that is where the whole problem lies, is it not? I don’t have a problem with evolution…. out of absolutely nothing and guided by absolutely nobody, an incredible intelligent and intellectual person (like yourself) with a material body came into being. Power, a God who created him for a specific plan and purpose! Was it a hoax ? What I found more interesting about this animal, for me at least, is the nerve that connects the brain to the “vocal centre” runs from the brain, ALL THE WAY DOWN to the base of the neck and then ALL THE WAY BACK UP to the “vocal centre”. Also whales have vestigial hind structures that are understood to have been hind legs at some point in time. IMO, does not lend credence to creation theory. The 97% “Consensus” now somewhat hysterically voiced by the Alarmists, is like the result of an election in one of the old Soviet States, Cuba or North Korea. You can vote but there is only one candidate. As such the “proof” that the idea is sound or that the elected government has a mandate is laughable. How wonderful to see that the MSM is at last catching up. If I were the author of one of those papers Mr Cook has appropriated into the consensus, I would would be seeking legal advice. How many times has advocate science told us man was causing catastrophic harm to the planet and have been wrong? Ice ages, ozone holes, acid rain and lately CAGW and even second hand smoke. Throw rocks all you like. The IPCC and model predictions have over estimated the effect of CO2 on global temperature and we are now seeing a rapid backpedal of alarmist claims. The climate reaction to 2xCO2 continues to be revised downward in scientific publications and CAGW stalwarts like OHC and extreme weather lack evidence. No worries joeldshore, you can still get all the mis-information of doom and gloom you like over at SKS and Open Minds. Knock yourself out. It IS a consensus. 100% of the 97% of the 34% will tell you that. Would that it were only Climate ‘science’ that is in this state. As you point out the health ‘science’ is in just as bad a state with unproven claims being daily published. Look at skin cancer and ‘sunshine’ scare leading to lack of vitamin D to the extent that rickets and fragile bones are reappearing (leading incidentally to the false claims of battered babies when it is lack of vitamin D in mother and baby). Butter is now slowly being shown to be more healthy than margarine and full fat milk is better for you than skimmed (watered) milk. I think that there is a need for ‘Science’ as a whole to step back and take a lesson from the Climate ‘science’ fiasco. If it doesn’t we are going to see the death of the age of enlightenment and a return to superstition wrapped up in marketing led snake-oil salesmen based on focus groups. The whole concept of “communicating climate science” is a strange one. Communication, among adults anyway, is a two-way street. “Because I said so” may (or may not) work with children, but with adults, not so much. Nor do threats, guilt-trips, bargaining, special pleading, and the whole gamut of psychological manipulations the climatists have attempted using. It works for a while, but then people start to see through it. Media hype only works for so long, particularly with widespread access to the internet, and actual information. Actually it is a failure to communicate bad science. They jump on every disaster (the latest being MOORE Oklahoma, not Monroe) to say “See! Told you so!”. Yet while their memories are short, most people’s are not. And they remember the same weather even when the alarmism was not in vogue. They are basically proving themselves wrong. Give them enough rope, and they will hang themselves with it. The merits of evolution aren’t the point. The point is that the opposition has a reason to oppose it. They are threatened by its implications. Some of them also make their living opposing it. The author of this shoddy article(it reads like the hockey stick died in 2006 ffs) is employed by people with a financial and political motivation to oppose the veracity of climate science. Even Anthony, when asked what bothered him the most about the mainstream view of climate, replied that he disliked the policy ideas flowing from it. You don’t see a large, motivated opposition to string theory battling it out in US newspapers. Why? Because nobody is scared of its implications. There’s one to pin on the wall! The point is that the opposition has a reason to oppose it. They are threatened by its implications. Your use of the fallacious ad hominem argument is typical of trolls. Climate “science” is shoddy, and in some cases, could be called fraudulent. This has been shown time and time again. But, if you want to get into motivations, what do you suppose is motivating climate scientists? Let me give you a hint; whole careers, and continued funding are based on them being right. Now that the whole basis of Alarmism has been exposed and is being undermined by reality, the big climb-down has begun. They know what’s coming, and are doing their best to escape it. I, too, would call it a failure to communicate faulty climate science. Unfortunately it hasn’t been a complete failure. Yes indeed, wind power, solar power, decarbonisation, carbon credit trading, NGO’s pushing schemes in the hapless third world etc. etc. Add to that the time it will take the politicians and pundits to change their stance without losing face. Oh, and the insane folk who know nothing about the science but howl on the comments of any online article about AGW. I would give it two to five more years for it to vanish completely. Remember in “Popular Delusions and the Madness of Crowds ” the collective goes mad all together at once yet return to their senses one at a time over months. Ryan, you’ve not presented a single refutation of the points made in the OP. But if you want to sit out there on your dead, rotting limb- fine. I don’t understand why Christian fundamentalists are unable to accept that evolution could be part of “His” great plan and move forward. Steve Goreham got me interested in the changing climate issue. Thank You. I am now more informed and a lot dumber than I thought I was. The desire for the powerful to dominant the weak is on full display in climatism. AGW True believers love to tell themselves this – it’s staggering! From here I see far more parallels between the arguments and tactics of the creationist community and AGW alarmists than sceptics – see furious back-pedalling, focus on irrelevant details as a diversionary tactic, changes of argument and shifting of initial premise when confronted with inconsistency, evidence presented boiling down to a matter of faith (models programmed with unfounded assumptions), failure to bring forth any physical evidence, reliance on ad hominem, clustering together in cliques that can act as a self-reinforcing echo-chamber and so on..
For confirmation of the above, please see your own post. You start off by claiming that the IPCC in their first report said what they did not say, then you justify it by pointing out that far later, when their initial predictions proved to rest on shaky ground, they began to change their argument. And this means their initial predictions were right? And what does it matter if the article uses a graph sourced from someone who decided to call them out on this? Reading your arguments is like playing a game of three-shells-and-a-pea. The entire point of this article is to demonstrate that historically, the science of AGW has been bad. Pointing out the fact that AGW arguments have merely metamorphosed over time when falsified or proven to be baseless serves to reinforce, rather than overturn this point of view. So the models are there to reproduce the biases and inaccuracies inherent in the surface temperature data rather than model average global temperatures! Your claim that alignment between satellite data and model predictions is ‘questionable’ is meaningless. What is genuinely questionable is how a sane and intelligent being can believe that the more you average computer simulations, the closer you get to reality. Kind of reminds me of illusionist Derren Brown’s conceit that he could get a hundred people to predict lottery results, average predictions and arrive at the correct number! Anyway, lest I be accused of a Gish Gallop, how about a proper criticism of Spencer / Christy’s methodology, written in layman’s terms, that does not consist of ‘it’s wrong because someone else did if differently’, or ‘it’s wrong because I don’t like what it says’? One hundred percent of the world’s top climate models, 44 models in all, projected a rise in global surface temperatures over the last 15 years. And 100 percent of the climate models were wrong. I guess that the alarmists will now say that it’s reality that is wrong and that the models are correct. Or maybe they can simply redefine reality as “what I really, really believe”. What, Ryan, does that have to do with anything? A scientific theory does not become valid because a theory in a completely unrelated field faces opposition. A large fraction of the public does not have the faintest clue about logical thinking. Christians do. If we take “Lucy” and “God”, in Ethiopia Christians, literally, lay side-by-side with Lucy. And yet, in Australia, we find a “missing” 150 million year old tree! Well, they probably will, but shouldn’t. All you’ve said (about the origin of life) is, “We don’t know.” Isn’t that the proper attitude of—even the inspiration for—science? And it has been said that wonder is the primary religious impulse. But I guess for some, even some ‘scientists’, it is blind belief in whatever ‘consensus’ they subscribe to. Well, if they try this they are on a big loser. ALL evidence points to cold being a bigger killer than warm, and in fact we’ve not yet warmed to the same levels as the Medieval Climate Optimum yet. If they do try to promote this alarmist drivel, they will quickly be shot down in flames. You talk as if most US newspapers were not a tightly controlled progressive socialist bloc. Not really related to the article posted above, but since it’s been discussed in the comments, I’ll simply add that I find no point of contention between the theory of evolution and my belief in a higher power. Although as a scientist/engineer, I do have issues with how the word “theory” is bandied about. You observe. You hypothesize. You test repeatedly. At some point, you have enough information to form a hypothesis, which by definition must be falsifiable. Except for obvious examples of microevolution, I’ve seen no tests performed nor any admission that evolution is at all falsifiable, which makes it weak science, in my opinion. Is there a fossil record? Yes. Do the fossils increase in complexity over time? Without a doubt. Is there any clear evidence, or any way to test, how such extensive speciation occurred from the appearance of the first single-celled organism? The answer is a big fat no. Also, no provable answer exists for the origin of life, which is outside the realm of evolution. Back to the topic at hand: mocking the alarmist true believers. I swear that if St. Louis were being ground to dust under a mile deep glacier that they’d still be prophesying that we were all about to burn up. Facts, data, reality: a Jedi AGW alarmist craves not these things. …Agree that there is meaningless consensus? Consensus argument from authority is a smokescreen for the CAGW socialist cabal. Is evolution random as Darwin opined or is it guided by unknowns as the fossil record suggests. I’ll take the empirical fossil record. There is a simple explanation for public distrust found in the wisdom of crowds. If you take a large jar of jelly beans and ask passersby to guess the number, their answers (guesses) will converge on the correct number. Now if a group of quarreling scientists analyzes the situation but can’t agree on whether the jelly beans unseen in the interior are the same size as all the rest and comes up with a “projection” that is radically different from what the average person on the street thinks, on average, the average people will not trust the scientists. The BS detector of the common man. Front page news, a first. Well said. As a former Christian and atheist I think you have a very good view of evolutionary theory. As you haven’t tried to twist a literal interpretation of Genesis into some kind of pseudo science it is obvious that you maintain a rational mind. Thanks for your post. First, I would say that “a large fraction of the public” preferred to ignore the cancer-cigarette link (and still does) and that the same could probably be said of the theory of evolution, possibly because many of its proponents use it to disparage others’ belief in God. However, I absolutely agree with your implication that the strongly-held beliefs of most climate alarmists are due to their being “organized and well-funded and/or motivated (by) opposition to the implications of the science”. That was what you meant, right? I mean, it’s obvious where the majority of funding has gone, and who has best organized government support, and which group could care less about the science if the science upsets their belief system, is it not? I’m not arguing for the validity of the science. The science speaks for itself. The title of the post asks a question. I’m answering it. The reason the public doesn’t overwhelmingly accept the science is because they are told regularly that they should not accept the science, just like they were by big tobacco a few decades back. Sometimes, even by the very same people. RIIIIIGHT. So tobacco spent millions funding think tanks that just happened to publish and distribute their documented lies…but it didn’t do anything. No effect whatsoever! The American people are logic-robots, immune to misinformation. When Pat Michaels goes on TV and says “The globe has been kind of cool” you guys didn’t believe it, right? Amazing. When the predictions fail, people will know it and they will, without the intellectual prowess of Richard Feynman, apply the scientific method intuitively. You miss the point. What the evolution example shows us is that there are always people who will reject the scientific consensus when it goes against their deeply-held ideological beliefs. As a practical matter, that means that one has to come up with some way of using science to inform public policy (such as teaching of human origins in schools or taking action on climate change) even in the absence of total unanimity (which is impossible). And, nobody has ever come up with a better way of doing this than having the scientific community summarize what they believe the current state of the science to be. In the U.S., this has traditionally be done through the National Academy of Sciences and it has served us well. The only other alternatives is simply not to use science at all to inform public policy or to have the particular political party that is currently dominating the government choose which science and scientists to believe, neither of which seems like a very good option to me. Yes…It is straightforward about what will happen over the next century. However, it does not predict that these rates of increase will be the ones seen over the next few decades. The graphs of temperature vs time were expected to have upward curvature. You start off by claiming that the IPCC in their first report said what they did not say, then you justify it by pointing out that far later, when their initial predictions proved to rest on shaky ground, they began to change their argument. And this means their initial predictions were right? And what does it matter if the article uses a graph sourced from someone who decided to call them out on this? As I point out above, the lines drawn are made up under the poor assumption that the IPCC predictions were just a linear rise in temperature over the century. Furthermore, why show only the predictions of the first assessment report, which is based on this poor linear assumption, when later reports more clearly stated what they expected to see happen over the next few decades? Anyway, lest I be accused of a Gish Gallop, how about a proper criticism of Spencer / Christy’s methodology, written in layman’s terms, that does not consist of ‘it’s wrong because someone else did if differently’, or ‘it’s wrong because I don’t like what it says’? It is wrong to compare the models’ surface temperature predictions to the results of the satellite measurements since they don’t measure the same thing. And, Christy’s alignment is suspect since it shows the observations aligned so that they are pretty consistently below the model results in the period from 1979 to 1990. At the very least, a real skeptic would ask how the data and model results were aligned. I think we need more stories about the benefits of co2 on plant life. As a practical matter, that means that one has to come up with some way of using science to inform public policy (such as teaching of human origins in schools or taking action on climate change) even in the absence of total unanimity (which is impossible). Are you advocating the same way of “informing public policy”, force the kiddies to believe they must take action on climate change? Force everyone to accept they must take action on climate change, it’s the “scientific consensus” that action is required? And, nobody has ever come up with a better way of doing this than having the scientific community summarize what they believe the current state of the science to be. Are you contradicting yourself? Acceptance of evolution was by forcing that as the only allowable origin of life that could be taught in public schools. You want to pass the tests, perhaps even pass the class and graduate, you learn and know evolution. You will be punished if you reject evolution. Thus the “better way” was forced education and the punishment of “deniers”. And true enough, as we see right now in the public education system, it is indeed very effective at generating acceptance of taking action on climate change. Exactly. There’s no justification for such an obvious lie. I can’t even imagine how anyone remotely interested in climate science wouldn’t know better. The point of illogical arguments such as yours is to attempt to mislead. I have called you on that, and you say I’ve missed the point? You go on simply to attempt to bolster your illogical arguments, which is pathetic. People reject your so-called “scientific consensus” primarily because it rings false. Even the “consensus” claim rings false, and speaks to the desperation of people such as yourself to believe the dogma of Climatism. Finally, you close with one further logical fallacy; the False Dilemma or Bifurcation Fallacy. Climate “Science” stepped outside the realm of actual science long ago. Skeptics or Climate Realists are merely attempting to correct that. Not to shock you or anything, but many people actually care more about what is true, than whether it happens to coincide with the position of whichever political party they may belong to. We have heard it all before. If the thing being communicated is the full and accurate reporting of the product of open / balanced /objective scientific principles and processes then the communication is a good scientific one. The climate science communities that falsely claim CAGW consensus did not make those kind of communications. Their communications communicated a subjective mindset focused on a mere ideological belief in being right about harmful climate change due to burning fossil fuels. Both honest and dishonest communication about their incorrect science is the cause of their failure to gain acceptance by open cultures. Hey Ryan ……. Can you clue in Anthony and the rest of us skeptics where we can get some of this funding? Well funded, my arse. Take a look at the ice cores for the last 15000 years and tell me again that the modern warming is “unprecidented”. So, your short answer, as near as I can figure, to my question of how else one might use science to inform public policy is to make Bruce Cobb the arbiter of what science is correct or incorrect, instead of the scientists themselves. Not to shock you or anything, but many people actually care more about what is true, than whether it happens to coincide with the position of whichever political party they may belong to. The social science is pretty clear on this: Non-experts (even ones with considerable education and knowledge) tend to decide what the science is on controversial scientific issues on the basis of their ideological beliefs. This site is living testimony to this. Now you’re just being stupid. I wasn’t suggesting that at all. There is plenty of available material here and elsewhere for you to read, but you aren’t interested, due to your ideological beliefs. Most of us here used to believe, to some extent at least, that CAGW must be true. We came by our skepticism through reading, and weighing the pros and cons. I realize this is an alien concept to you people. Perhaps it is just intellectual laziness, but there is a wilfullness and dishonesty about it. What are you trying to hide? Humility won’t help you get ahead, according to a study which found that loud and opinionated people are taken more seriously even when they are wrong. Well as far as I’m concerned climateer journalists have certainly been loud enough. But not even that seems to have worked. It’s not so long ago that the human appendix and tonsils were thought to be vestigial. The “understanding” you refer to may well turn out to be just the opposite. Your way of “using science to inform public policy” involves the forced indoctrination and acceptance of god-less evolution in the public schools, pushing the “scientific consensus” that no higher power could be involved at all, in any way possible, directly contradicting religious belief. Yes, heaven forbid we should have students learning science in the SCIENCE classrooms instead of superstition and mythology. Superstition and mythology have their place in the lives of kids if the parents so desire, but not in the science classroom.